I didn’t do anything fancy, just boot each up and look at their system/task managers. Â The Linux systems have Chromium/Google Chrome running, and Jolicloud has Apache and Mysql services running, but they both ran at about 200Mb – 250Mb and minimal CPU usage. 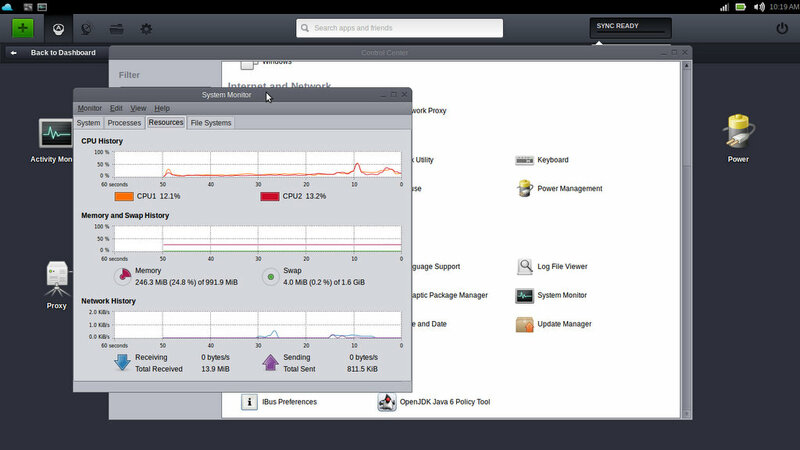 Â On the Linux systems, I immediately launched the system monitors upon boot and took a screenshot. On Windows, however, I didn’t even have a screenshot app, so I had to find one first. Â This brought the usage down a little, down to around 650Mb (it boots with about 750Mb), but CPU was still up there and bouncing around a lot, just lower than during bootup. 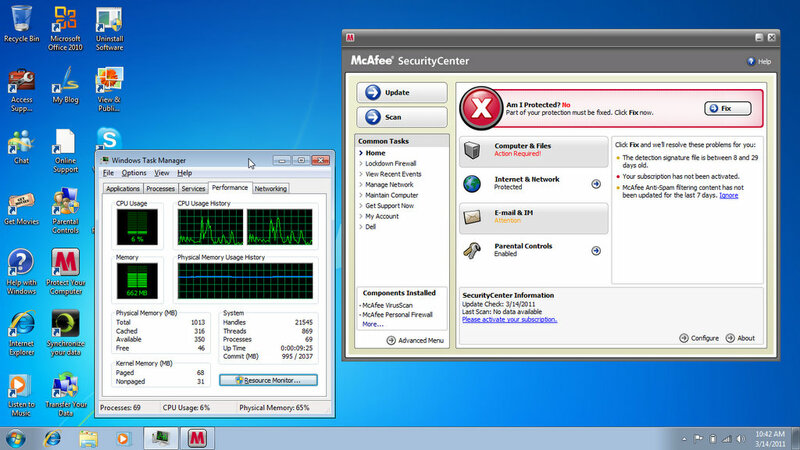 Â Keep in mind also, on Windows, the Dell came with McAfee antivirus, which is running and using resources. Â But NO WEB BROWSER is running on Windows in the screen shot. What I found really annoying, was that once Internet Explorer was launched, so I could upload a screenshot, the memory went up and over 800Mb! Â I only have 1Gb in this thing, so there’s really no room for apps to run. Â I am sure an extra 1Gb of memory would help, but it wouldn’t make it any faster. The thing just runs slow regardless under Windows. Â On the Linux side, they run slow too, just *not as slow* feeling as Windows does. Â At least there’s room in 1Gb to run some apps. It was odd though, because Windows sitting idle would run a low cpu percentage, like under 10%, and commonly with 2-5%. Â Once you do anything, the cpu spikes up, and with IE running, it runs 100% for a while. 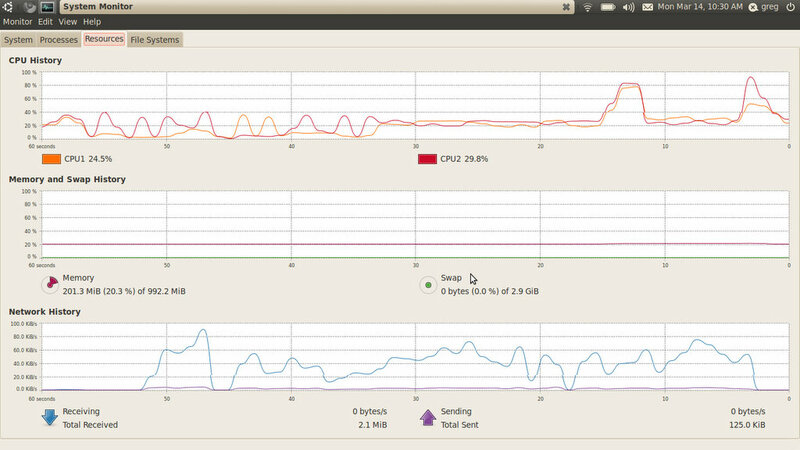 Â On Ubuntu, you can see it running consistently around 25%, which spikes just like Windows, only not 100%. Â Jolicloud runs a little better, with about 10 – 15% resources at idle, with the occasional spikes too. Â They all spike up when you do anything, but Windows spikes way up, and a lot of the time its at 100%. Â Could be, that’s why it seems slower, and that may be caused by extra swapping to disk because Windows requires much more memory. Â (I don’t really know, just a theory) Â Just my opinion, concerning the general operational responsiveness, Ubuntu 10.04 seems to run a little better than either, but Jolicloud is very close and not reallyÂ noticeable. I think its just the UI they’ve got that’s just a tiny bit slower than the Ubuntu GUI. Â But its not a big deal. Anyway, here’s the screenshot of Windows after about 5 minutes from boot. And below is the Jolicloud screenshot. And last, below is Ubuntu 10.04 Lucid Netbook Remix version.